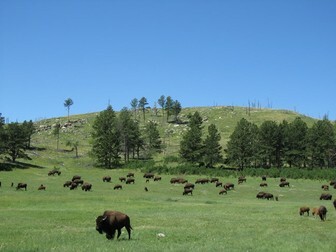 Bison, elk, and other wildlife roam the rolling prairie grasslands and forested hillsides of one of America's oldest national parks. Below the remnant island of intact prairie sits Wind Cave, one of the longest and most complex caves in the world. Named for barometric winds at its entrance, this maze of passages is home to boxwork, a unique formation rarely found elsewhere.